Peter Mark Roget-polymath, eccentric, and synonym aficionado-was a complicated man. He was an eminent scholar who absorbed himself in his work, yet he also possessed an allure that endeared him to his mentors and colleagues-not to mention a host of female admirers. But, most notably, Roget made lists. 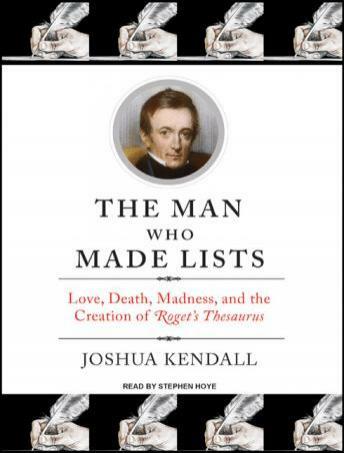 From the age of eight, Roget kept these lists with the intention of ordering the chaotic world around him. After his father's death, his mother became overbearing and despondent. Soon, his sister also descended into mental illness. Despite these tragedies, Roget lived a colorful life full of unexpected twists and discoveries-including narrowly avoiding jail in Napoleon's France, assisting famed physician Thomas Beddoes by personally testing the effects of laughing gas, and inventing the slide rule. Evocative and entertaining, The Man Who Made Lists lets readers join Roget on his worldly adventures and emotional journeys. This rich narrative explores the power of words and the everlasting legacy of a rediscovered genius.